Michael Barkman the chairperson of CFS speaks at the CFS rally outside side of the leg. University of Manitoba Students’ Union (UMSU) vice-president external Wilfred Sam-King said he was prevented from addressing students during the Canadian Federation of Students’ (CFS) Day of Action demonstration on the steps of the Manitoba Legislature on Nov. 2. 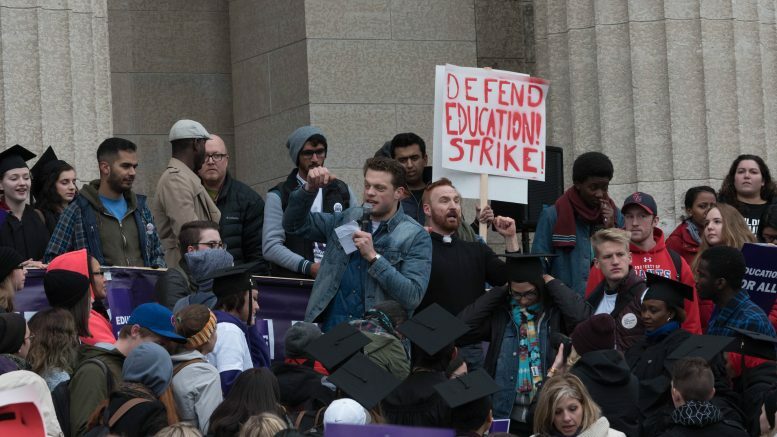 According to UMSU president Tanjit Nagra, the Manitoba chapter of CFS told Sam-King he would have time to address students from the steps of the legislature. However, after waiting with other speakers for his turn, Sam-King was removed from the speakers’ list. According to Nagra, CFS-MB had originally approached her to make a speech but she declined due to a scheduling conflict. Sam-King was to speak in her place. Among the speakers who did address demonstrators at the legislature were CFS-MB chairperson Michael Barkman, University of Manitoba Faculty Association president Mark Hudson, University of Winnipeg Students’ Association vice-president external Sadie-Phoenix Lavoie, CFS-MB international students’ commissioner Saif Baloch, and U of M student and mental health advocate Aly Raposo. Despite being unable to address the gathered crowd, Sam-King said he was happy to see a University of Manitoba presence at the rally. “I was so proud of our U of M students today,” he said. Hundreds of students from across the province, joined by members of numerous labour unions, marched from the University of Winnipeg to the legislature calling on the provincial and federal governments to eliminate tuition for post-secondary education and increase funding to education in the province. The Day of Action event consisted of an opening rally on the quad of the U of W, followed by a march down Memorial Boulevard to the Manitoba legislature and speeches on the front steps of the government building. Attempts to contact CFS-MB chairperson Michael Barkman requesting comment were not returned. Disputes between the U of M student union and CFS are nothing new. In 2013, UMSU held a review of the union’s membership in CFS after tensions had grown between the two student-run groups regarding day-timers. Members of the then-UMSU executive ripped pages of CFS promotional material out of 20,000 student day-timers after learning it was unable to cancel a contract signed by the previous executive for the purchase of the promotional materials. The relationship continued to sour and for the next three years UMSU refused to pay its fees to the advocacy group. In March of last year, UMSU council voted to condemn CFS-MB for expressing what it called political favouritism toward the provincial NDP during the spring provincial election. In June, UMSU council agreed to pay CFS nearly $1 million in outstanding fees after settling the dispute. Members of the University of Manitoba Student Action Network (UMSAN) said their group was also prevented from speaking at the protest. In a release issued on Nov. 5, UMSAN stated that it first requested an opportunity to address the demonstrators in September. The release states that they did not receive a response from any CFS executive until just days prior to the event, when they were told they would have one minute to address the crowd. However, the release goes on to detail that when an UMSAN member attempted to address the protestors, he was immediately interrupted.